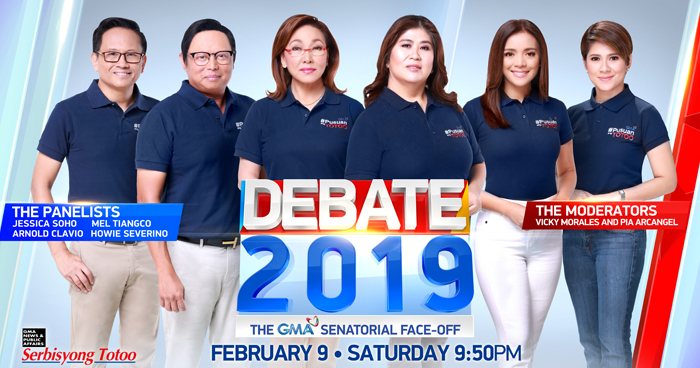 True to its commitment to delivering the most credible coverage of the upcoming May polls, GMA News and Public Affairs mounts Debate 2019: The GMA Senatorial Face-Off this Saturday, February 9. This senatorial debate will be moderated by GMA News pillar Vicky Morales and senior news anchor Pia Arcangel. Esteemed GMA News pillars Jessica Soho, Arnold Clavio, Howie Severino, and Mel Tiangco join the debate as panel members. The debate will give voters a chance to get to know the candidates running for 12 coveted seats in the Philippine Senate. Debate 2019: The GMA Senatorial Face-Off will tackle various topics ranging from the candidate’s track record to his/her stand on various national and international issues. Questions to test each candidate’s credibility and competence are also included. Senatorial hopefuls will undergo two major rounds of debate to give them a chance to interact with and ask questions to fellow candidates. The first round will see senatorial bets under the scrutiny of the country’s most respected broadcast journalists. In this round, each candidate must answer a main question from their pre-selected interrogator. Soho, Clavio, Severino, and Tiangco will ask the main questions, while other candidates have the opportunity to ask their fellow candidate a follow-up question. In the second round, candidates with opposing views shall debate on key national issues. In this round, senatorial hopefuls will argue for or against a particular issue, and will be paired with another candidate who has an opposing view. Should the Philippines legalize divorce? Should term limits be removed? These are just some of the questions that are up for debate. Debate 2019: The GMA Senatorial Face-Off aims to help citizens make an informed choice in the upcoming elections. On Saturday night, voters will get the opportunity to know the senatorial aspirants better and find out where each candidate stands on the most pressing issues. Catch Debate 2019: The GMA Senatorial Face-Off this Saturday, February 9, 9:50PM on GMA.